The numbers of Australians, along with other westerners, visiting Turkey has recently declined dramatically. This is a consequence of ongoing political instability in the country following last year’s attempted coup d’état and a series of terror attacks. The Australian Government also recently warned of potential attacks targeting the Gallipoli battlefields on Anzac Day. A significant decline in this pilgrimage activity will likely have a wider impact on the way Australia understands Gallipoli. This is particularly the case given the continued resonance of an Anzac narrative characterised by a historical empathy for Turkey’s perspective on the war. The Gallipoli campaign has, in recent years, become part of the culture wars in Turkey associated with the rise of political Islam. This has seen Gallipoli increasingly referred to in relation to an Islamic jihad, and as an invasion of crusaders into the house of Islam. Approximately 1 million Turks visit the battlefields each year. And an estimated 10 per cent of the Turkish population have at some stage engaged in some kind of martyr tourism at Gallipoli. Mr Erdoğan has been a central figure in linking the Gallipoli campaign with Islamic conceptualisations of the Turkish nation. 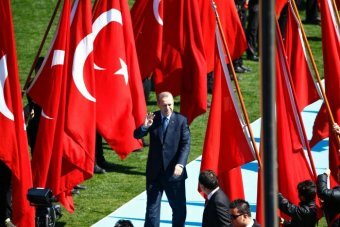 Following the failed coup, Mr Erdoğan also evoked the memory of Gallipoli. Recreated scenes of the Ottoman victory in the land battles against Anzac soldiers played on large screens in Taksim Square as he addressed cheering pro-government crowds. The vision was taken from a controversial TV commercial originally produced for the centennial commemorations of the Gallipoli battle. Its use of various Islamic symbols was widely interpreted as breaking with traditional secular ways of remembering the campaign. Significant shifts in Turkish memory of Gallipoli are not unprecedented. Since the 1930s there has been a few turning points in how the campaign is understood. First, and most significant, was the victory of the Ottoman Imperial Army in being “Turkified”. Arab, Kurdish, Greek, Armenian and Jewish soldiers and officers were cleansed from the official narrative. This also involved de-emphasising Germany’s role as the Ottomans’ allies in the first world war. Turkish pilgrims once were told the same historical tales by the guides that also took Australian and New Zealand visitors around the battlefields. But now, the vast majority of locals visit through bus tours that are arranged by Islamist municipal administrations for their residents, free of charge. This trend is apparent in an increasing popular march that re-enacts the mobilisation of the legendary 57th Regiment to defend the highlands from Anzac troops. This involves approximately 20,000 young boys and girls from scouts and other paramilitary organisations. And it is common for participants to wear T-shirts remembering their ancestors who fought at Gallipoli. It’s hard to know precisely what the consequences of these new commemorative rituals will be for the collective memory of Gallipoli. From fieldwork research on the Anzac pilgrimage, the motivations and meanings taken away from the battlefields are often different from that which politicians and social commentators have often assumed. Brad West is an associate professor at the School of Communication, International Studies and Languages, University of South Australia. Ayhan Aktar is chair professor at Istanbul Bilgi University. Posted on April 23, 2017, in ConspiracyOz Posts. Bookmark the permalink. 2 Comments.